Rockpoint Logistics has been implementing a program for the past two years that is designed to improve company performance in almost all aspects of the business. The results? Management is very pleased. Mark Pell (CEO) stated, “In an effort to consistently improve performance for our customers, Rockpoint Logistics has been utilizing a program designed to expand employee knowledge in every step of our operation. We feel this creates an entrepreneurial atmosphere where everyone feels ownership in our company. This in turn creates a feeling of empowerment to increase productivity and improve performance. The bottom line translates into a more dynamic system for our customers”. The program, which is entitled “Continuous Improvement Program” or CIP is intended for the management team at Rockpoint Logistics to participate in the day to day operations of the facility. The program requires all management employees to be involved in a training program where they experience the job functions of the logistics operations team. 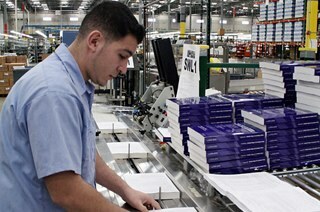 Prior to the start of their training, each employee must be certified before performing any job on the operations floor. Once they have passed the training, they will be encouraged to spend 5% of their time assisting on the floor. Ms. Smith went on to explain, “By working on the operations floor, the team will learn how management decisions impact the core operations of the business. This knowledge improves the effectiveness of the management team as they lead the operations of the business”. The major areas that are being impacted include quality control, customer satisfaction, cost control, expense reduction and production efficiency. However, this program is also having a very positive impact in other areas, including employee morale and job satisfaction. Communication among departments and a general understanding of the role other departments play within the company has also increased. Rockpoint Logistics feels the program has helped to improve process understanding, increase teamwork, improve employee recognition, improve process design and generate an overall improvement in the company’s efficiency and effectiveness. Company CEO – Mr. Pell added, “Through this program our employees have a higher level of accountability to each other and we are seeing improved results in collaboration and simplification”. “We’re very happy with the results”, Mr. Pell concluded.